Well, the old public market building is still standing, begging for some attention and a new life, or maybe just begging to be put out of its misery. This year marks the 16th anniversary of its closure, meaning a child born the same year this place shut down is now old enough to drive. This property seems to attract an unusual type of developer. One who doesn’t seem to make any effort to actually do something. Maybe it’ll be flipped again? Wouldn’t it be great if some deep pocketed developer with true community pride made the current owner an offer he couldn’t refuse? So much potential. A public market can work here. It HAS worked here. It IS the right location. Way, way back in 1986, an even older funkier market at this corner was thriving. It was our semi-rural community’s “third place”. The problems came when the owner decided to construct the place above and dramatically increase the rent to rates that were equal to what the West Edmonton Mall was getting. Vendors couldn’t afford that, and the place died a sad, slow death. Now, with the explosion in population in the Newton area, it’s the perfect time to have a new option for Sullivan Heights and Panorama. The neighbourhood is booming with young families who love shopping at stores like Choices, Whole Foods and a cross border favourite Trader Joe’s. Speaking of Trader Joe’s, when I was at the TJ store in Bellingham WA. yesterday, I looked around and thought, wouldn’t the old market place on 64th & King George be perfect for BC’s first Trader Joe’s location? There’s a good reason Costco chose this area for its only Surrey store. Newton is the centre of Surrey. Literally. Of course, TJ’s most likely won’t be popping up here anytime soon. But we can always dream right? Just picture this in your neighbourhood! Just spotted this story on Twitter. 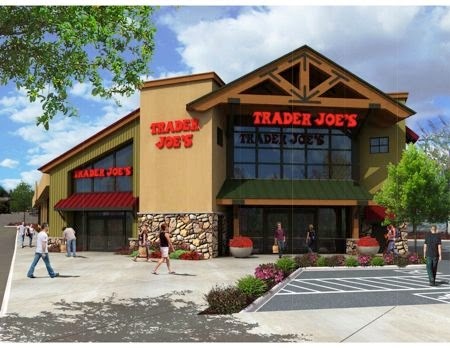 Looks like we’re not the only ones to be dreaming of a Trader Joe’s opening in the neighbourhood!